the end is nigh: abi curtis and naomi booth launch the apocalypse - Words Matter. On Thursday 30th November, at Waterstones in York, Abi Curtis and Naomi Booth launched their novels Water and Glass and Sealed: two dystopian novels which in different ways deal with environmental issues and climate change. As part of the audience, we were delighted to listen to the readings of extracts from the books and to the debate in the Q&A session afterwards. On Thursday the 7th December we met Abi and Naomi to ask them a few more questions about their novels. We would like to encourage everybody to read these two beautifully written novels. Fear not, we promise not to reveal their plots in too much detail. As Abi Curtis explained after her reading, in Water and Glass she intended to focus on our ecological responsibility towards the environment and on the idea of a blank slate. Would it be really possible to start all over again? In the mornings, for the first few seconds after she wakes, she never remembers where she is. And when she does realise, she thinks of how they are never in the same place twice, but pushing through the dark blue sea as if moving deep into the heart of a shadow. Water and Glass explores the personal grief of the main character and the communal grief of a society that has lost everything and must start again. We have asked Abi how important it was for her to communicate to the reader the intertwining of the two stages of grief and she said that it was her intention to reveal the personal grief of the protagonist very early on in the novel, in order to then explore the novel’s second dimension of grief and connect it all together. The idea of the ‘dark blue sea’ is another important theme of the novel, as a psychological symbol of everything that has been repressed. We came out here to begin again. We came out here for the clear air and a fresh start. No one said to us: beware of fresh starts. No one said to us: god knows what will begin. In the debate in Waterstones, both Abi and Naomi have explained the reasons for deciding to have what a reader defined a ‘balanced’ ending. In both novels, the endings of the books balance optimism and pessimism in order to reflect the authors’ belief that the end of our ‘world’ is not yet determined and there is space for humanity to decide to go towards a different attitude in regard to pollution, environmental damage and climate change. 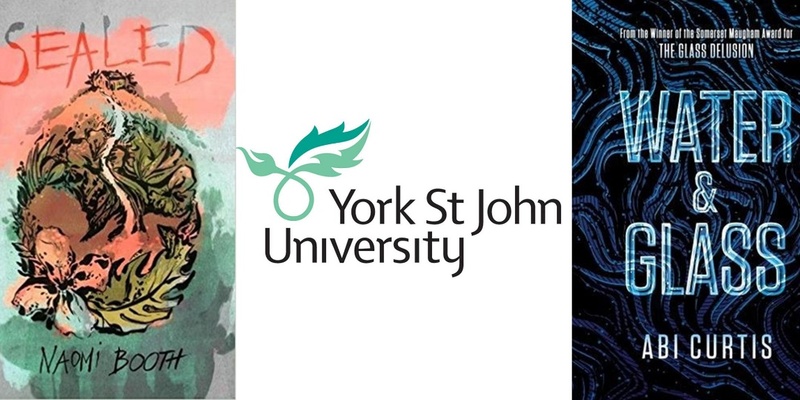 Abi and Naomi are part of the York Centre for Writing, the vibrant writing community at York St. John’s University that both consider an inspiration for their writing. They explained how being part of a writing hub that includes staff, the student community and national and international visiting writers and to share that sense of community was a great stimulus in producing Water and Glass and Sealed.